The Brazil Nut Tree forms quite extensive forests along the Amazon and Orinoco, where it reaches a height of 100 to 150 feet and a diameter of 3 to 4 feet. The botanical name of the tree is Bertholletia excelsa. The leaves of the tree are long, with wavy edges and the round fruit is 4 to 6 inches in diameter. This fruit is inclosed in a thick woody shell which contains about one dozen angular seeds or Brazil nuts. The tree is propagated by seed or layering. 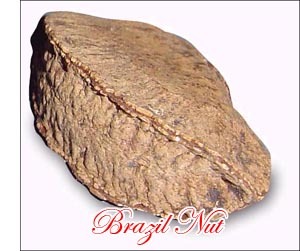 The Brazil nuts of commerce come chiefly from South America but the tree is also quite widely cultivated in the Oriental Tropics, particularly in Ceylon and the Federated Malay States.